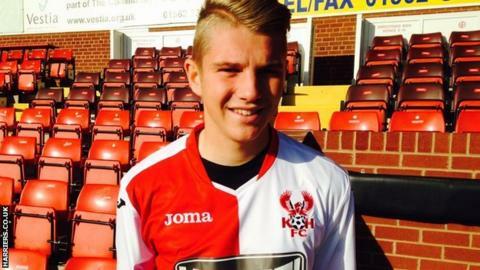 Kidderminster Harriers midfielder Ben Whitfield says he is surprised the fans have taken to him so much given that he is only at the club on loan. The 19-year-old has extended his stay at Aggborough until early January after arriving from Bournemouth in October. "I get a few tweets from fans and they sing my name at the end of the game," said Whitfield. "You don't expect that as a loan player because you're only here for a certain amount of time but I'm enjoying it." Whitfield has yet to break into the Bournemouth first team but made an immediate impact at Harriers by scoring on his debut against Altrincham. He netted his second goal for the National League strugglers in Saturday's 2-0 win over Aldershot and is hoping he can keep the supporters happy. Bournemouth beat a number of clubs - reportedly including Premier League Everton - to the signing of Whitfield, who signed an 18-month deal from non-league Guiseley in January 2014. "My game's all about working hard and if players don't work hard the fans aren't going to like them," Whitfield told BBC Hereford & Worcester. "I'm just doing my best for the team and they're liking what I'm doing, so I can't do any more." After two wins in a row, Harriers have lifted themselves off the bottom of the table but remain six points from safety - and Whitfield is aiming to help put the club in a much better position by the time he returns to the south coast. "The lads are buzzing," he said. "We need to go away now and play like we have at home and keep moving up that table and, before we know it, we'll be out of the relegation zone. "My last game is 2 January, so we'll see what happens."